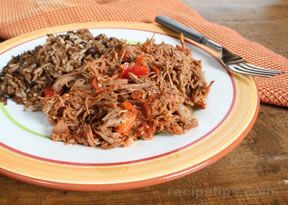 Ropa vieja means "old clothes," which the meat resembles when it is shredded. 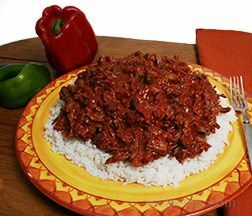 Stewed with tomatoes, pepper, garlic and onions, ropa vieja is a Cuban favorite. 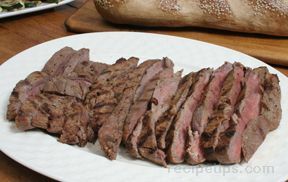 Place flank steak in large pot with water. Add half of onion, half of green pepper, salt, garlic, and cumin. Bring water to a boil and then reduce heat and simmer for 2 1/2 hours or until flank steak becomes tender and easily shredded. Remove from heat and allow to cool. When cool, remove meat and shred, holding meat with one fork and pulling apart with another fork. Heat olive oil in skillet that is large enough to hold meat. Sauté second half of onion, a minced clove of garlic, second half of chopped green pepper, a seeded chile pepper of choice, (depending on the intensity desired) and saute until onion is translucent. Place shredded swiss steak into the skillet and combine with other ingredients. Add tomato sauce, tomato paste, and meat broth mixing into shredded meat. Cook for 40 minutes or so. Serve over bed of cooked rice garnished with peas or use as a sandwich filling.